Ceramics form the core of the collection, and Sir Alan made it his aim to select objects of high quality while at the same time creating a collection that provides us with a broad journey through the history of Chinese ceramics. Early Tang earthenwares are present as well as high-fired stonewares and porcelains of the later Ming and Qing dynasties. In-between, we find a superb collection of wares from the Song dynasty, particularly good quality celadon and iron-glazed pieces. Highlights include the Ru ware brush washer [LI1301.229], an object of subtle and delicate beauty that is rarely seen. This is not surprising when you consider that there is believed to be less than one hundred pieces of Ru left in recorded existence today. Production was also limited to a short time period of about forty years, and was manufactured exclusively for use in the imperial household. Another piece worthy of note is the Guan ware brush washer [LI1301.48], a very highly refined example of the potter’s art. Barlow also collected a small number of bronzes, in particular very fine bronzes of the Shang dynasty, objects that were crafted some three thousand years ago. The University of Sussex displayed a particularly fine tripod vessel or ding [LI1301.2] from that period. 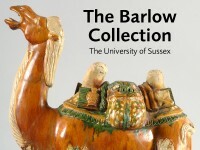 Barlow also supplemented his collection with a number of carved jade pieces. Some are small and portable objects that he may have been able to carry with him while away from his collection, such as the Han dynasty jade disc [LI1301.30]. Other pieces are more ornamental such as the jade vessel [LI1301.29], carved in imitation of an earlier bronze vessel.